The worldwide decline of coral reefs threatens the livelihoods of coastal communities and puts at risk valuable ecosystem services provided by reefs. There is a pressing need for robust predictions of potential futures of coral reef and associated human systems under alternative management scenarios. Understanding and predicting the dynamics of coral reef systems at regional scales of tens to hundreds of kilometers is imperative, because reef systems are connected by physical and socioeconomic processes across regions and often across international boundaries. We present a spatially explicit regional-scale model of ecological dynamics for a general coral reef system. In designing our model as a tool for decision support, we gave precedence to portability and accessibility; the model can be parameterized for dissimilar coral reef systems in different parts of the world, and the model components and outputs are understandable for nonexperts. The model simulates local-scale dynamics, which are coupled across regions through larval connectivity between reefs. We validate our model using an instantiation for the Meso-American Reef system. The model realistically captures local and regional ecological dynamics and responds to external forcings in the form of harvesting, pollution, and physical damage (e.g., hurricanes, coral bleaching) to produce trajectories that largely fall within limits observed in the real system. Moreover, the model demonstrates behaviors that have relevance for management considerations. In particular, differences in larval supply between reef localities drive spatial variability in modeled reef community structure. Reef tracts for which recruitment is low are more vulnerable to natural disturbance and synergistic effects of anthropogenic stressors. Our approach provides a framework for projecting the likelihood of different reef futures at local to regional scales, with important applications for the management of complex coral reef systems. 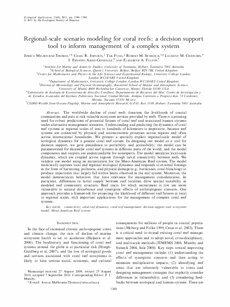 connectivity; coral reef dynamics; coral reef management; decision support tool; ecosystem model; Meso-American Reef system.